All our cottages are dog friendly and are very welcome free of charge..
Fellside Lodge is a self catering holiday cottage on the lower slopes of Catbells in the Borrowdale Valley Keswick. Surrounded by the fells of Borrowdale. Set in 8 acres of peaceful grounds., it is home to the red squirrels and a wide variety of bird life. The property is 4 miles from Keswick and a 10 minute walk to Derwentwater in which you walk through Manesty woods. Grange in Borrowdale is 1 mile down the road. There is also direct access straight onto the fells and lakeshore via the garden. Fellside Lodge sleeps 2/6 people and all the accommodation is on the ground floor. There is a large farmhouse kitchen in pine and tiles floor, which is fully equipped with oven, hob, dishwasher, american fridge freezer, microwave, washer/dryer and a large pine dining table that seats 6 with plenty of room. Connectiong to the kitchen there is a spacious lounge which over looks the garden, patio area and the Borrowdale Valley with ample seating and tv (freesat) and DVD player, radio and cd player. 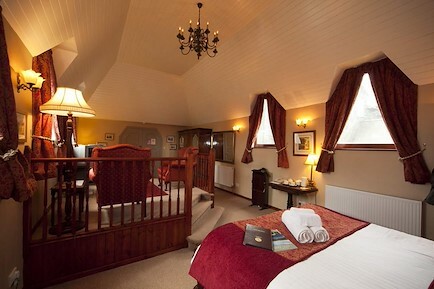 There is a double bedroom with king size bed overlooking the garden with a twin bedroom across the hallway. The other twin bedroom has an ensuite walk in shower room and a seperate WC. There is also a large family bathroom with bath and over head shower. The hallway is tiled so you can hang your wet coats & boots up. Fellside Lodge is fully oil central heated and within the price of the rental with the electricity and all bed linen. Heather View is a 3 bedroomed cottage set in the village of Threlkeld, near Keswick, in the northern Lake District. Threlkeld is a small village situated at the foot of Blencathra which is a popular walk. The village also has 2 pubs both of which serve excellent food and drink. Heather View is ideally located for those looking for a picturesque base in which to explore the northern fells straight from the cottage. The cottage can accommodate up to 6 people in 3 bedrooms, there are 2 double bedrooms one with en suit shower room with walk in shower, WC and wash basin also a twin bedroom. There is a large family bathroom, with bath and over head shower a washbasin and WC. There is a separate dining room with ample seating for 6 people with views overlooking Blencathra the lounge is just across the hallway with woodburning stove, there is a TV, DVD player this also overlooks Blencathra Fell. The kitchen is well equipped with electric oven and hob, microwave, fridge freezer, and dishwasher. There is a separate utility room with washer and dryer and were you can also put your bikes and walking gear. Heather View is fully central heated. Towels supplied. Guests are able to enjoy the peaceful garden in which the cottage is set and take in the views, there are table and chairs for 6 people and a bench to relax on. There is private parking in the garden for up to 4 cars. Keswick is only a 5 minute drive away with plenty of shops, pubs and restaurants, you can walk to Keswick from Threlkeld via the old railway lines. Keswick golf club is just up the road. The Old Barn is situated in Newlands Valley overlooking Catbells. The property can sleep 6 people in 3 bedrooms. Rowling End The Old Barn is a 3 bedroomed cottage sleeping up to 6 people. The kitchen is well equipped with everything you will need with dishwasher, microwave, hob and oven there is a washer and dryer in the utility room. Woodburner in the lounge. The Lounge over looks Catbells and The Newlands Valley, there are two double bedrooms and a twin. The Farmhouse is next door to The Old Barn and the property sleeps 6 people in 3 large bedrooms 2 superking one with ensuite and a twin bedroom plus large family bathroom, the kitchen is full equipped with dishwasher, oven and hob, microwave, there is a seperate utlity room, the lounge over looks Catbells and Newlands Valley with wood burning stove. A traditional Lakeland farmhouse which provides relaxed luxury accommodation for up to eight people, in 4 bedrooms, 1 king size ensuite, 1 twin ensuite which can be made into a superking and an twin/super king and king size with a family bathroom to share, there is a farmhouse kitchen with Aga and dining table and a well equipped kitchen, two lounges one with open fire and the other with a woodburner. With its Aga kitchen, wood burning stove and stunning views, Rowling End is the perfect base to enjoy the dramatic landscape whatever the weather.Situated in the heart of Newlands Valley opposite Catbells. Rowling End commands outstanding views of the entire valley from every window. For up to 6 guests and provides comfortable accommodation in a wonderful setting. The location provides the perfect holiday base for many Lakeland walks without the need for a car. Whether you are looking to explore the high fells, lakes, valleys or wish to just enjoy the stunning views Rowling End is ideally situated. The Mouse House offers exceptional comfort, warmth and style for your holiday in one of the Lake District’ most beautiful and tranquil valleys.The Mouse House is an idyllic retreat for two people. It can be booked with Rowling End to provide accommodation for 10 people, ideal for groups celebrating a special occasion or relaxed get-togethers with family and friends. Lake Derwentwater is a pleasant fifteen minute walk across the fields where you can catch the regular Keswick Launch to Keswick. Braithwaite Village is three miles away with three pubs and a general store and just one mile across the field or down the lane is the Swinside Inn serving good food. Wainwright spoke of Newlands`s greatest blessing as the undisturbed peace and freedom from mass tourism and commercialisation and today the valley retains that relaxed way of life. At Keswick, take the second exit. Turn left at the T junction, then right at the 1st mini roundabout. Follow the signs for the B5289 towards Borrowdale out of the town centre, going straight on at the next roundabout then right at the following roundabout. After about 4 miles, turn right over the bridge into Grange. Follow the road through the village and continue along for about another ¾ mile. You will pass Manesty cottages on the left and then a caravan site on the right. Shortly afterwards on the left, you will see a wooden sign on a tree with the name 'Scalethorns' The Coppice and Fellside on. Threlkeld Keswick From M6 jct 40, head towards Keswick on the A66. After around 12 miles you will start to see signs for Threlkeld and Keswick golf club, take the first turning to the right, straight into the village. Travelling West on A66 from the M6 Motorway (Junction 40), continue towards Keswick bypassing the first Keswick turn-off. Take the left turning sign-posted Portinscale/NewlandsValley. Continue through the village of Portinscale past the marina. After approx 1.5 miles turn right sign-posted Swinside/Stair/NewlandsValley/Buttermere. Go through Stair, past Stair Mill on your right and up the hill across the cattle grid until you come to Ellas Crag Guest House on your left. Follow the road which leads to Buttermere for a few hundred yards where on your left you will see a gate with a sign on for Rowling End. Your enquiry will be sent directly to Fellside Holiday Cottages. Please fill in as much detail as you can.